Three copies of each score must be handed to the jury secretary on the day of the competition. 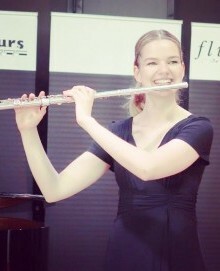 Stichting Nationaal Fluitconcours can take pictures or make recordings during the performances for publication for the purpose of promoting Stichting Nationaal Fluitconcours. For publication permission is required from the finalists or in case of a person under age from the parents. Please check the correct box below: Yes, I give permission to publish pictures and recordings . No, I do not give permission to publish pictures and recordings. The registration fee amounts to € 50.00, plus (where applicable) the costs of making use of a competition pianist (€ 90.00) and group accommodation (€ 35.00 per night). 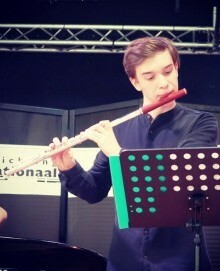 Participants are required to transfer this amount to account number: IBAN: NL22 RABO 0323 9354 27 (BIC: RABONL2U) in the name of Stichting Nationaal Fluitconcours, stating the participant's name. Applications must be received before January 1st. After receiving the application form, the secretary will send a confirmation. After January 1st, the applicant will receive a definite placement. Incomplete application forms will not be accepted. Participants will not be placed if the application fee (and possible pianist fee) has not been received before January 1. By sending the application form, the participant acknowledges having read the participants' rules and regulations.